Whatever your your food preferences, Happy Thanksgiving to All! To be honest, I’ve learned a few things since I made this Sweet Potato Pie. * I wanted a holiday dessert that could be enjoyed by my eclectic family of vegans, carnivores, omnivores, gluten- and dairy-free eaters. A. Not everyone with a dairy sensitivity can tolerate butter. Try substituting Spectrum shortening in an equal amount for a dairy-free crust. B. The ingredients for the crust need to be really COLD. Before making the crust, put the butter pieces (or Spectrum) in the freezer for 10 minutes before adding them to the flour. Let the ice chill the water for at least 10-15 minutes. C. Have some patience when making the crust. The dough should form a cohesive mass when a small amount is squeezed together in your hand. Mine did not and, while the filling was light and flavorful, the crust was a bit tough. 1. In a food processor, pulse the coconut flour, arrowroot flour, and salt until well mixed, about 10 seconds. Add the cold butter in the food processor and pulse until the flour becomes crumbly, about one minute. 2. While the food processor is running, pour in the ice cold water in a slow steady stream. Add enough water for the flour to start to bind together. If it doesn't come together in the mixer, put the dough in a bowl and add water until it forms a cohesive ball - work fast. The dough may still be crumbly, but should stay together when you press the dough together in your hands. If not, add a bit more water until it forms a pliable ball. 3. Once the dough can come together, put it on a sheet of plastic wrap, form it into a ball, and then wrap it and place it in the fridge for about 30 minutes to an hour. 4. Steam the sweet potatoes for about 30 minutes, or until a fork goes in easily. 5. 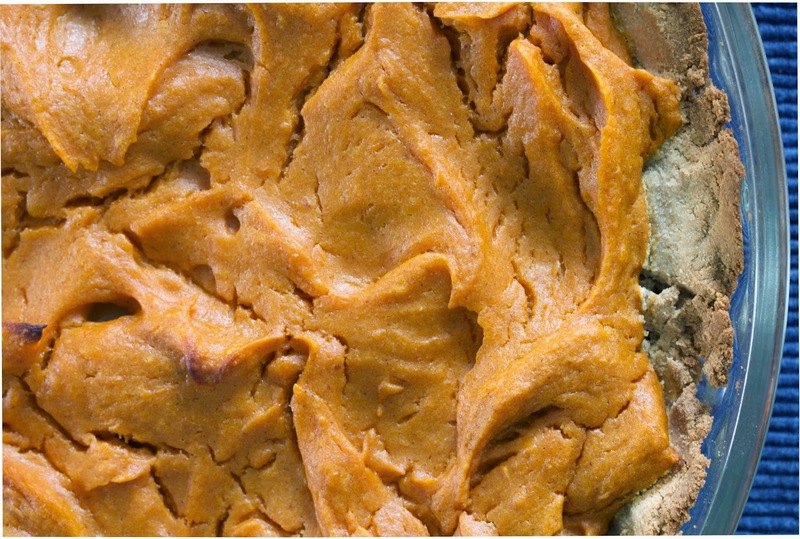 After the sweet potatoes have cooled, put them in a food processor and puree them with the coconut oil and eggs. Add the orange zest and juice, maple syrup, spices and vanilla. Taste for sweetness. 6. 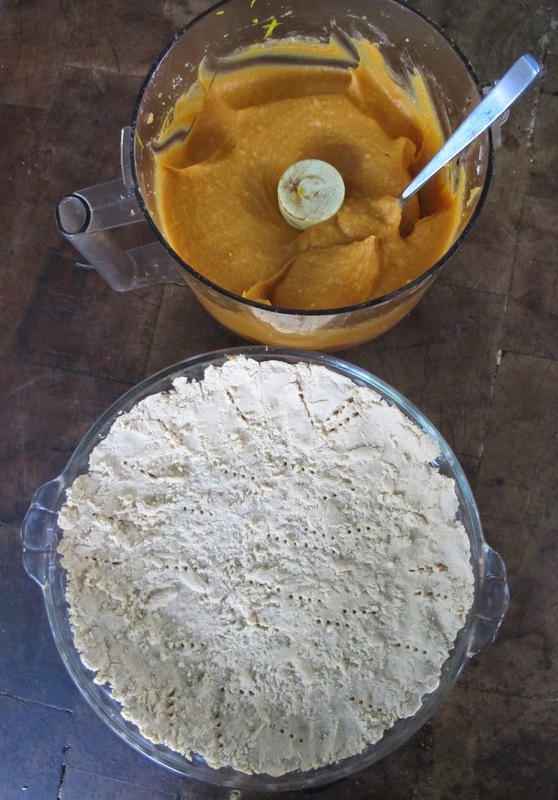 Remove the pie crust from the fridge and roll it out, lightly floured, between two pieces of parchment paper. Place it in the pie plate and press it out with your fingers to flatten it on the bottom and up the sides. The crust should have an even thickness throughout. 7. Using a fork, poke holes on the bottom and sides of the crust. Place it in the oven for about 10 minutes. 8. Remove the crust from the oven and put the filling in the crust. Put it back in the oven for about 50 minutes, or until a skewer comes out clean. Cool the pie on a rack for about an hour. Optional: Coconut Whipped Cream topping, see recipe in previous post "Himalayan Mousse"